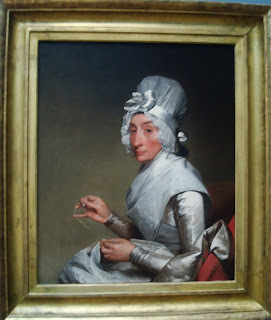 So many of the people in portraits at the National Gallery of Art are so serious and even grumpy looking. But in the case of this portrait of Catherine Bras(s) Yates I understand why she is grumpy. Not only is he making her look up from her needlework but. 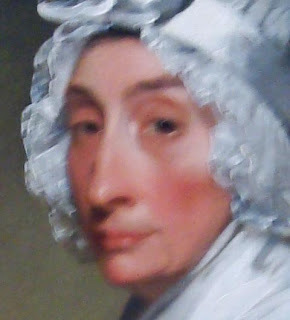 . .
the artist, Gilbert Stuart, had the gall to paint in the hairs growing above her lip. How dare he! Faithful representation? Less of a beauty concern back then? (or attractive trait? Of the few things I took away from War and Peace in junior high was the phrase "downy upper lip," which I guess Tolstoy liked).